Spring, Summer & Fall: RINK WILL BE OPEN AND LIGHTS ON UNTIL 10PM DAILY DEPENDANT ON WEATHER. Check calendar for private event closures. How YOUR Community Rink Ice Is Made and Maintained. Twin Brooks Community League provides the community with wonderful facilities for family enjoyment, including a full size NHL outdoor skating rink. Volunteers from the community (NOT City of Edmonton staff) do all the work creating and maintaining rink ice and managing the facilities. 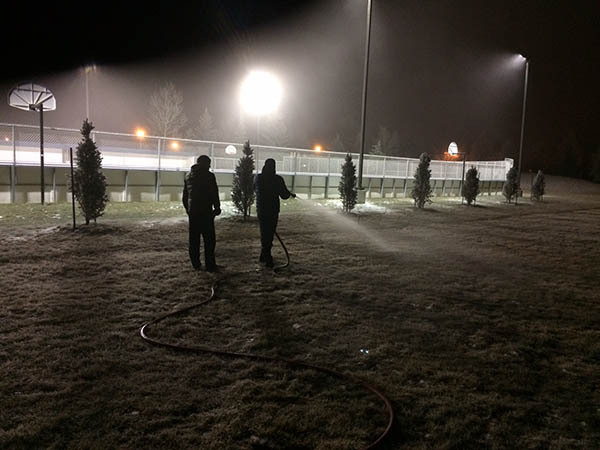 Maintaining the rink in the winter mostly involves ice maintenance, and ensuring the surrounding walkway areas around the rink are safe for public use. The quality of the ice is dependent on the frequency of weekly maintenance performed. All maintenance for the rink is provided by resident and neighbouring community volunteers. Once the ice is established, maintenance to keep the rink in excellent skating condition requires 3 to 4 nights per week of scraping and flooding (3-4 hrs/session) or weekend mornings for those early risers. In past years, this task has been completed by teams where 1or 2 volunteers may sweep rink (power sweeper), and then another volunteer or two can come later and flood the surface, thereby breaking up the commitment time. The Community League is well equipped with snow blower, power sweeper, power reel to retract hoses and other tools, so the task is not as strenuous as it may sound, but is made easier with more hands helping. Getting the ice ready at the beginning of the season, takes up to 30 hours. The team of volunteers usually flood for 6 nights in a row (weather permitting) and involves prepping the surface (snow removal if needed) & as many thin layered floods per night as possible to eventually build the ice thickness up to 1.5 to 2 inches (4 to 6cm). This task is much easier with more people on shifts of 2 hours or so. That way the team can keep the flooding going all evening as one end of the rink freezes while you flood other areas. With enough volunteers, each individual may only have to come by 1 or 2 nights of that week. That operation usually starts in late November or first week of December. We have experienced ice maker volunteers in our community who are more than willing to show new volunteers the art of rink maintenance and the science of ice making. No previous experience needed. On a daily basis, after skating is done for the evening, the entire ice surface should be shoveled/power swept. Skates create snow and the snow needs to be thrown over the boards. Pushing it to the side of the boards just degrades the ice surface and creates more work. This task takes about 1 hour and is a perfect task for someone wanting some exercise (besides shovelling the driveway). Several opportunities for volunteering exist. Snow removal after snow fall can be accomplished any time of day with use of a snow blower and power sweeper but is necessary before rink can be re-opened. If your schedule permits, once trained, daytime rink maintenance is always possible also. 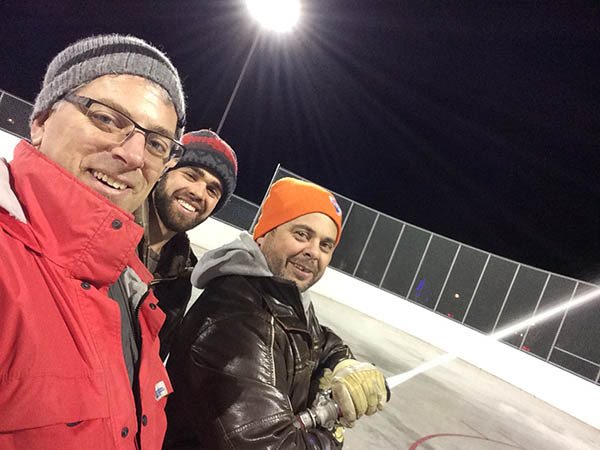 The goal for the volunteer rink maintenance crew is to provide the community with quality skating surface for winter enjoyment of the outdoors. Ice making & maintenance is a time consuming operation made easier with many volunteers. Weather plays an important role in the success of our rink & Mother Nature always seems uncooperative. Daily dustings of snow render the ice unusable until cleared. Both the rink and community centre are solely run by volunteers (NOT the City). So please be patient when making requests. Several times in past years, the rink has been closed due to overworked volunteers and not enough help. Rink maintenance can be quite enjoyable. Lots of comradery at the rink as our volunteers are a great bunch or people. We have several Parent/Teenager teams helping as well. Teenagers are a good proportion of the users of the rink, so it is great when they come out to help maintain it.